43 mm polished steel case, sapphire back, fixed steel bezel with anodised blue aluminium ring, sapphire crystal with anti-reflective coating, blue sunray dial with gilt skeleton superluminova-filled hour and minute hands, calibre br-cal.305 automatic movement with hours, minutes, small seconds at 6 o'clock, blue alligator strap, polished steel folding buckle. Water resistant to 100 meters. 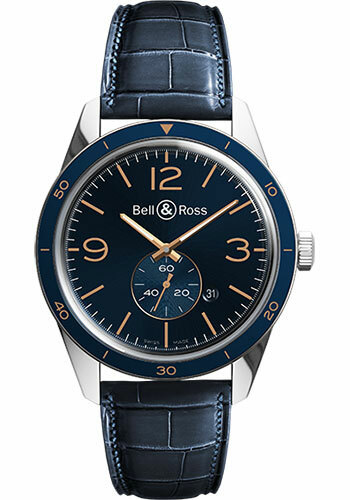 43 mm polished steel case, fixed steel bezel with anodised blue aluminium ring, sapphire crystal with anti-reflective coating, blue sunray dial with gilt appliqué numerals and indices. gilt skeleton superluminova-filled hour and minute hands, calibre br-cal.305 automatic movement with hours, minutes, small seconds at 6 o'clock, polished steel folding buckle. Water resistant to 100 meters.